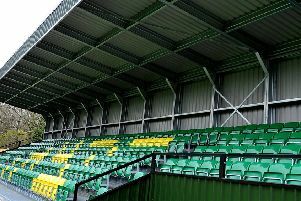 Horsham's top-of-the-table clash in the Bostik League South East Division with Ashford United at Culver Road ended in a 0-0 stalemate this afternoon. Second-placed Horsham started the day a point ahead of their third-placed visitors and that is how it remained at 5pm. However, Hasting United's 3-1 win against Three Bridges saw them leap into second place, while fourth-placed Haywards Heath drew with leaders Cray Wanderers. Horsham were much improved in the second half and their best chance actually saw Chris Smith smash home a rebound from a saved shot, but it was ruled out by a late offside flag. That was the clearest chance in a tight second half with both teams seemingly settling for a point in the closing stages. Former Horsham player and assistant manager Tommy Warrilow had taken charge of the Nuts and Bolts in November and overseen them to 12 victories in 15 matches to send them soaring into the play-off places. It was billed as the clash of the day in the South East Division and a scoreline of 3-2 back in November where Horsham came from 2-0 down to grab a 96th-minute winner only whet the appetite further. The hosts made one change from the team that beat Greenwich Borough 2-0 last Saturday with Kieran Lavery dropping to the bench as Lewis Hyde returned from injury to slot in at centre-back along Dylan Merchant with Joe Shelley being pushed into midfield. The visitors started well and stroked the ball about from left to right across the Culver Road surface, although the only effort their neat passing produced was an effort dragged well wide of the target. Pelling was first called into action on 11 minutes as a neat ball through saw Danny Parish spring the offside trap and the Horsham stopper beat his angled effort back into the danger zone, Jerald Abagye, whose driving run had started the move, then slipped as he looked to put away the loose ball. Moments later, Toby Ajala turned Jack Brivio in the box and his effort was again saved by Pelling and the follow-up blocked by Harvey Sparks. The next chance came in the 26th minute and it was created again from strong Ashford running. In the final third, Trey Williams slipped in Ajala and his shot across goal whistled narrowly wide of the far post. On the half-hour mark and brave bit of goalkeeping from Pelling kept the score levels. A lofted ball over the top found Parish in space and as he brought the ball down the Horsham stopper raced out to block the ball low as the striker attempted to shoot. The hosts were gifted a chance in first-half injury-time as Abagye needlessly barged Chris Smith over to the left of box, but Lee Harding's effort was straight at Sam Mott. Horsham manager Dominic Di Paola switched the formation at half-time with Shelley dropping into a back three and Brivio sitting just in front with Sparks and Metcalf moved out to wing-backs. The Hornets had the ball in the back of the net inside three minutes of the second half. Smith followed up to smash home as Mott parried a Harding effort from outside the box, but a very late flag from the assistant referee saw it ruled out for offside. It was a battle of attrition for much of the second half with Pelling saving a couple of comfortable efforts, before Smith sprung the offside trap from a Shelley ball on 69 minutes. He raced forward on the right, but tried to shoot from a tight angle when a ball across goal was the better option. Metcalf was then close to getting on the end of a low cross and from the resulting corner, Shelley headed just over the bar. With 12 minutes to play, Pelling collected a Jake McIntyre free kick which was well placed just outside the box and Merchant then put in a brilliant tackle to block away Ajala on the left. Horsham: Pelling, Metcalf, Hyde, Merchant, Sparks, Brivio, Hayward, Shelley, Harding (Lavery 82), O'Toole, Smith (Richardson-Brown 74). Unused subs: Lovegrove, Kirkwood, Hogan. Ashford: Mott, Aboagye, Kamara, Coker, McIntyre, Anidugbe (Cox 85, Munyama 90), Corner, Prescott, Ajala, Parish (May 72), Williams.